Flavor is my favorite. Whether it's Italian, Mexican, Asian, American, or anything else I cook- as long as it's made with fresh ingredients and full of flavor, you can count me in! 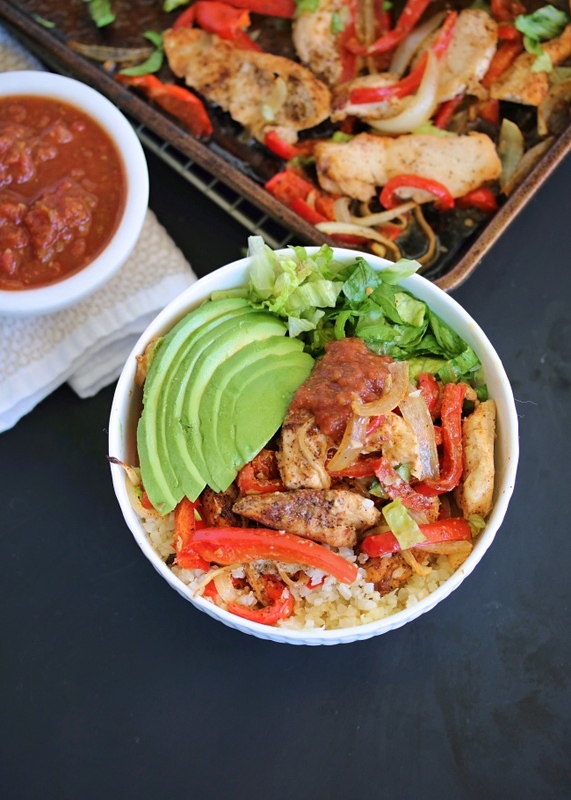 I love these chicken fajitas for just that reason- they're not overly spicy, but they are a party for your tastebuds! Sheet pan meals are also a huge win for me, so I did it double this time: two sheet pans, one meal. First pan is the chicken fajitas, with sliced peppers and onions, minced garlic, and sliced chicken breast (you could use thighs too- or even shrimp if you see my notes below!) It all cooks at once, tossed in some avocado oil and a blend of fajita spices- and is so easy! Second pan is the cauliflower rice. If you haven't tried roasting your cauli rice yet- you're missing out! It's super easy, and in my opinion gives the best flavor and texture. 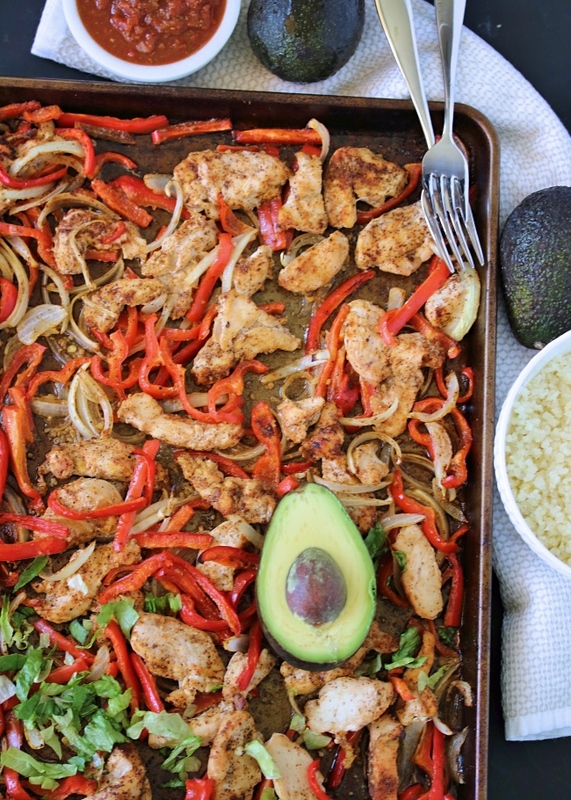 And since the chicken fajitas are already in the oven, you might as well throw the rice in there too right!? Easy peasy. It all cooks together at the same time- no stress. I do toss it halfway through, because I like the chicken & veggies to get browned & yummy on all sides (it wouldn't be bad if you didn't though). 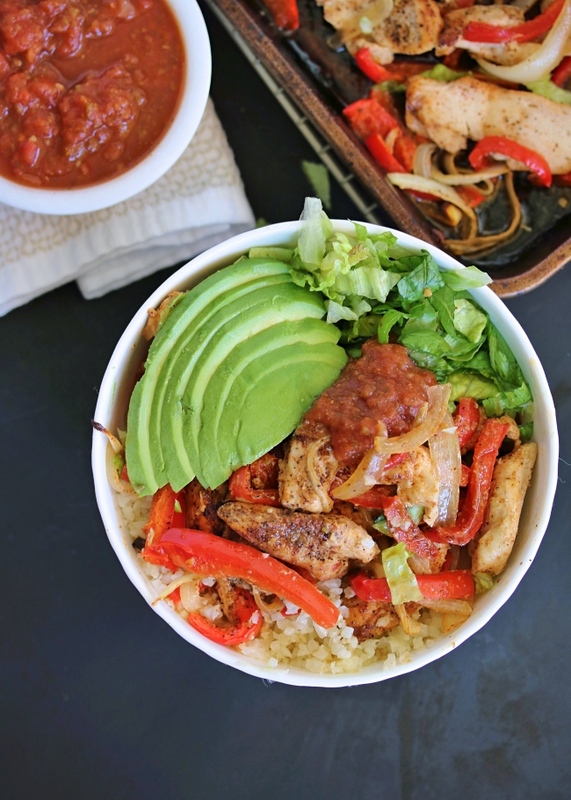 Serve this up "build your own" style- where everyone stacks up their own rice bowls! 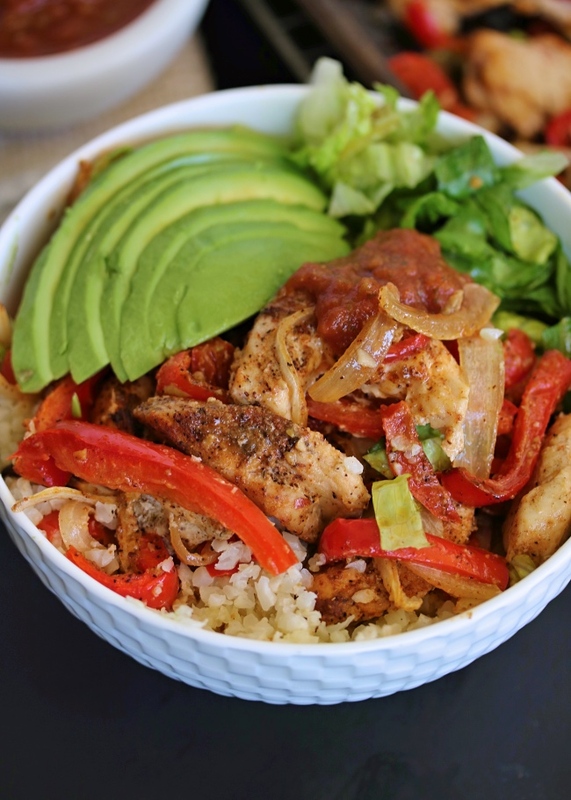 We start with a scoop of cauli rice, then layer with the chicken fajita mix, and then go all in with the garnish. Sliced avocado or a scoop of guac, fresh lime wedges, and some salsa are our favorites. Looking for an easy dish to meal prep for your week's lunches? THIS recipe is your friend! Save yourself a million dishes on Sunday afternoon, and whip this up in the oven. It reheats super well & tastes better the next day. Preheat the oven to 400ºF. Line two baking sheets with parchment paper, or grease them lightly with your choice of cooking fat. 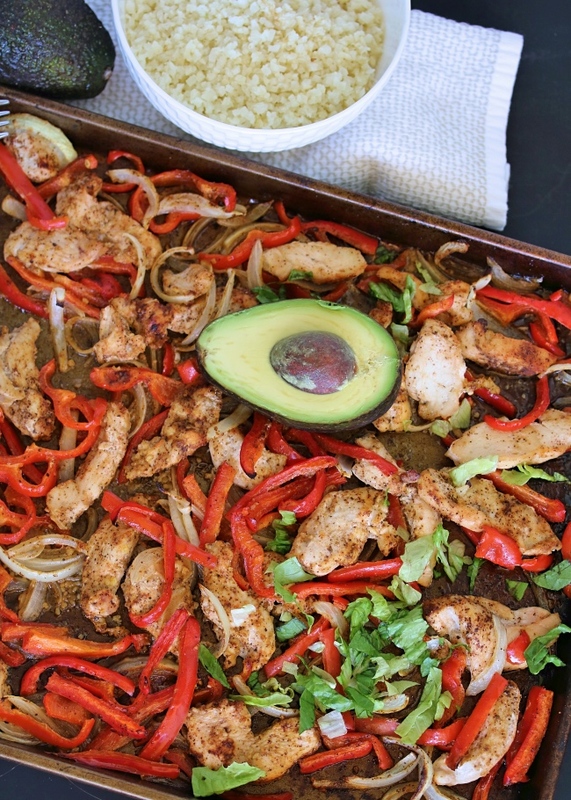 On one baking sheet, prepare your fajitas by laying out the sliced veggies and chicken. Season with spices then drizzle with avocado oil. Toss to coat evenly. On another baking sheet, toss the cauliflower rice with avocado oil and salt & pepper. Lay out in a flat layer. Place both baking sheets in the oven (I put the cauliflower rice on the lower rack) and bake for 20 to 25 minutes. Toss the chicken and vegetables once halfway through for even cooking. 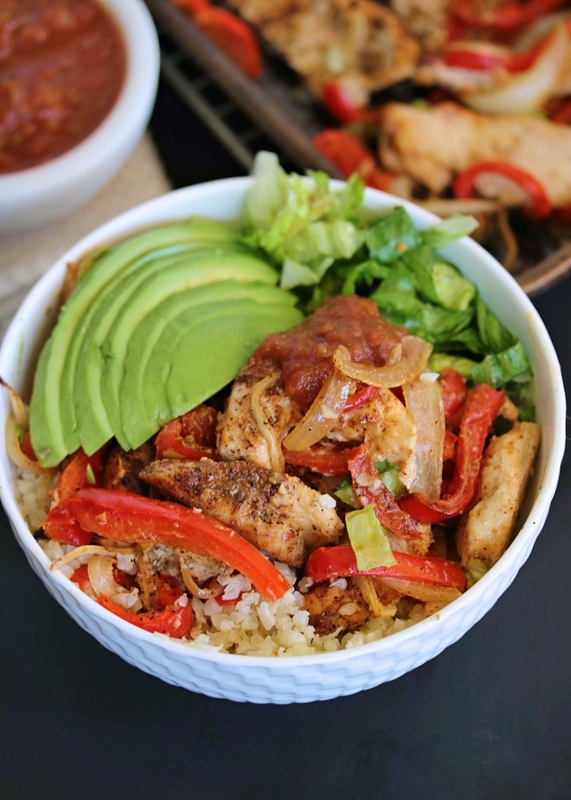 Serve in bowls with cauliflower rice on bottom, and the chicken fajitas on top. Layer with your favorite garnish- avocado, chopped cilantro or red onion, salsa, or fresh lime. Enjoy! If you'd like to make this with shrimp, simply roast the veggies alone to start and add the shrimp to the sheet pan during the last 8 minutes! If I’m using frozen veggies, do I thaw first or just cook from frozen? You can cook right from frozen! Do you ever use frozen Cali rice?